﻿ Holter Cable and Leadwires - Shenzhen Medi Farcoo Medical Co.,Ltd. Shenzhen Medi Farcoo Medical Co.,Ltd. 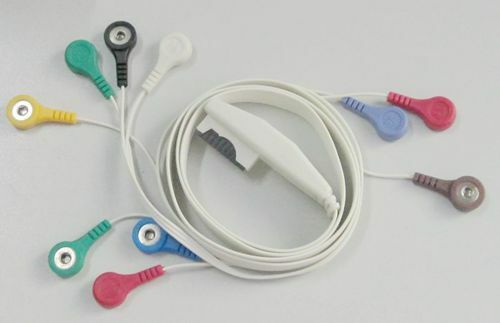 have the rich supply for Holter cable and leadwire for the mainly and popular brands of Patient Monitors, such as DMS holter cable, Biomedical Instruments, Brentwood, Contec, Landcom, Mortara, NEC, Nihon Kohden, Philips, DIN1.5 Style, and so on. All of the cables are made with Nylon Plug, Gold-plated needles and totally compatible with the original machines. The TPU cable is with five core shielded wire, there will be no allergic when exposed to human body. The Semiconductor coating has the characteristics of high performance antistatic and noise interference. The special alloy wires increases the cable's working life by 3-5 times. The Gold-plated terminals and snap fasteners ensure the signal connection to be more accurate. The product performance exceeds the international standards of cables and leadwires. Welcome any of the distributors, hospitals/clinics, doctors to contact us for enquiry and purchase.